I think if you just gave me a cowboy hat, I'd totally be an 80's cowgirl with my outfit today. 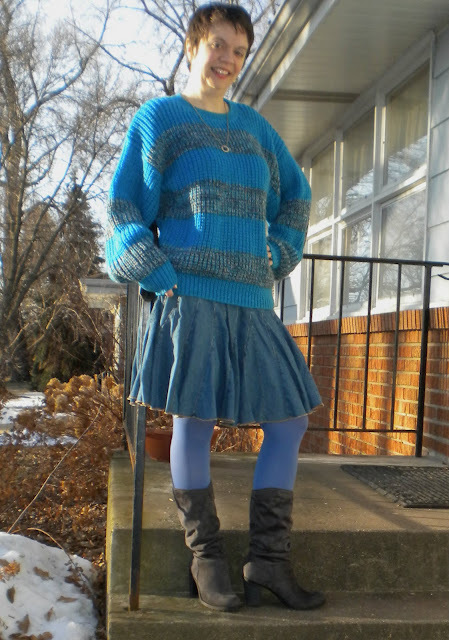 Oversized sweater, boots, jean skirt? Yep, I'm a cowgirl! Truthfully it is likely one of our last cold days as highs are going into the 60F range (!) this weekend so I thought, you know I haven't worn this sweater in awhile and I really want to again. No use saving this for Megan and Keely's Super Stripes week coming up in a couple of weeks - cause I don't think it'll be cold enough by then! I decided to wear this with a skirt even though it is actually really chilly outside today, because it's a different way to style this sweater. And I love the result, even if I am a cowgirl stuck in the 80's. 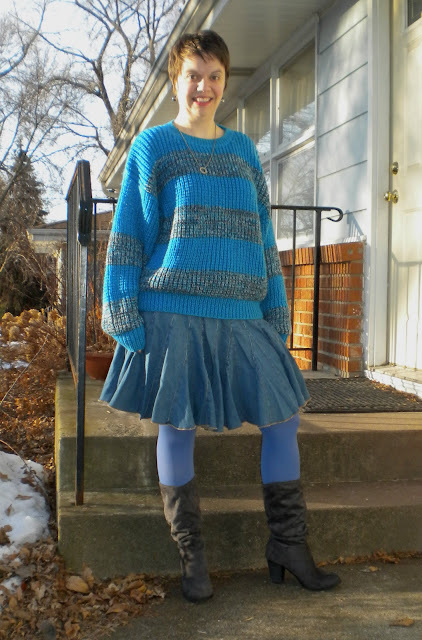 It's comfy and is also giving me an excuse to wear colored tights again! I was smart with these boots today guys - remember how I said I almost fell when I wore them another time? Well if I was really smart I'd have gotten insoles for them, but instead, I added an extra layer of sock! It seems to be keeping my foot more stable, so I will hopefully have no problems. I was wearing them one day after the day I nearly fell and one of my co-workers is like "what's wrong? You're walking strangely" because I was kind of being really over-cautious in them. So my hope is to not appear that way today! The sun is shining, I have coffee and it's Friday and the weekend looms ahead of me free and clear. Could you ask for more than that? Yipee-ty-ay-yay! That's cowgirl for Happy Friday! You are so sweet! Yes - we totally should meet in person sometime, a coffee/tea date perhaps!! <3 Have a great weekend! That is a fun sweater. 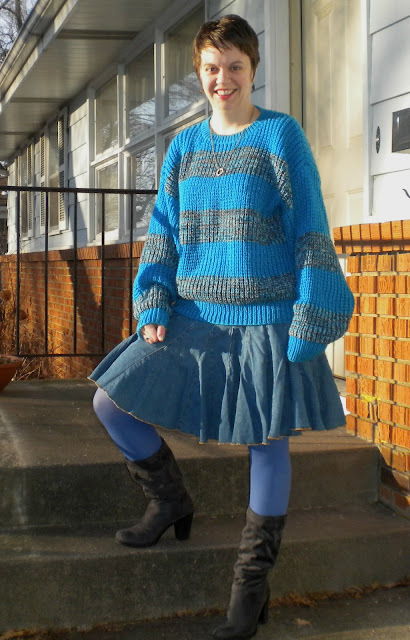 I am hoping it will be too warm for heavy sweaters soon! Love that skirt. I want to see how it pairs up for springy outfits. Hooray for better fitting boots. I finally took the pair I wore today and cut the insole in half. The heel-cup portion didn't fit well with it, but the toe part was too big without it. Solution? Cut it in half!